So far the best film of 2017 concerns the dying, rotting carcass of the French Sun King and the most suspenseful moment in the film is when the king manages to digest a cracker. 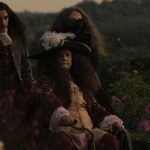 Director and co-writer Albert Serra’s The Death of Louis XIV is an 18th century version of a 48-hour stay in the observation wing of Mount Sinai Hospital, only instead of charting the illness of a methadone addict, the film takes on, with a detached and icy perspective, the death throes of France’s longest reigning monarch (a 72-year reign from Louis XIV’s ascension at four-years-old until his death in 1715) as the king’s gangrenous leg goes from bad to worse and his retainers hover over him trying to halt the king’s deterioration. And playing the legendary Sun King is an equally legendary film legend, Jean-Pierre Léaud, whose lordly grumbles and snarls turn the film into more than a meditation on a dying king and into a meditation on the dying art of cinema. Albert Serra’s previous works (Honor of the Knights, Birdsong, The Story of My Death) all deal in stories of the mundane, as great historical and literary figures are brought low by the banal, revealing the humanity of the great. Serra expands minimal actions – Louis XIV trying to walk, swallowing water and chewing food, having salve applied to his gangrenous leg – into major sequences. At one point in the film, the king’s managing to swallow some food elicits triumphant applause from the figures crowding around his deathbed. Will someone at the Academy of Motion Picture Arts and Sciences please finally give Léaud an honorary Oscar? At the end of The Death of Louis XIV when Louis XIV dies the Sun King takes sixty years of French cinema with him.